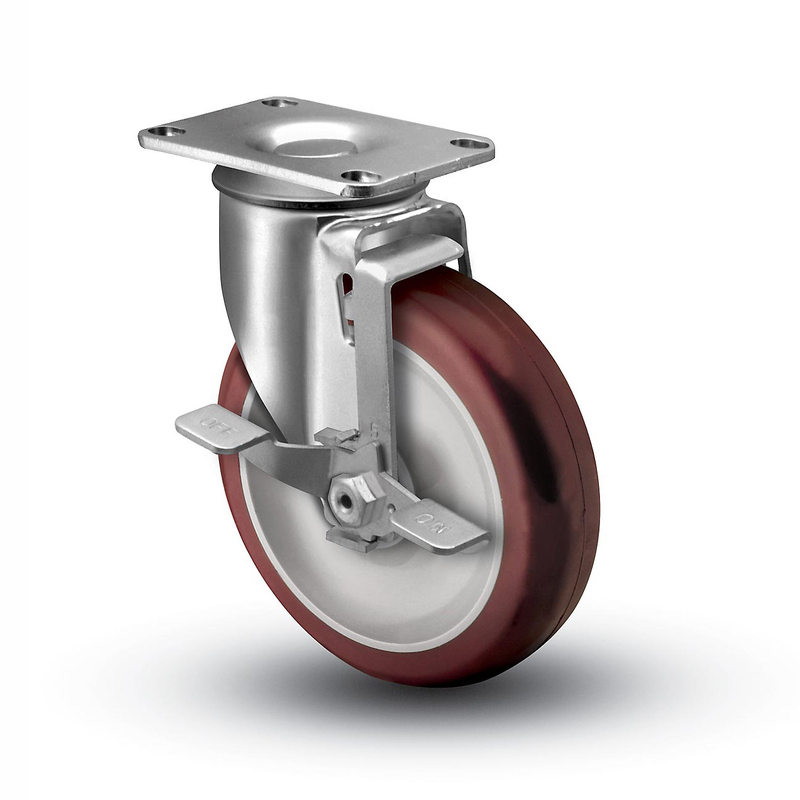 Different from most other brake options, the directional lock brake does not stop the caster’s wheel from turning; this brake prevents the swivel section from turning and changing the load’s direction. 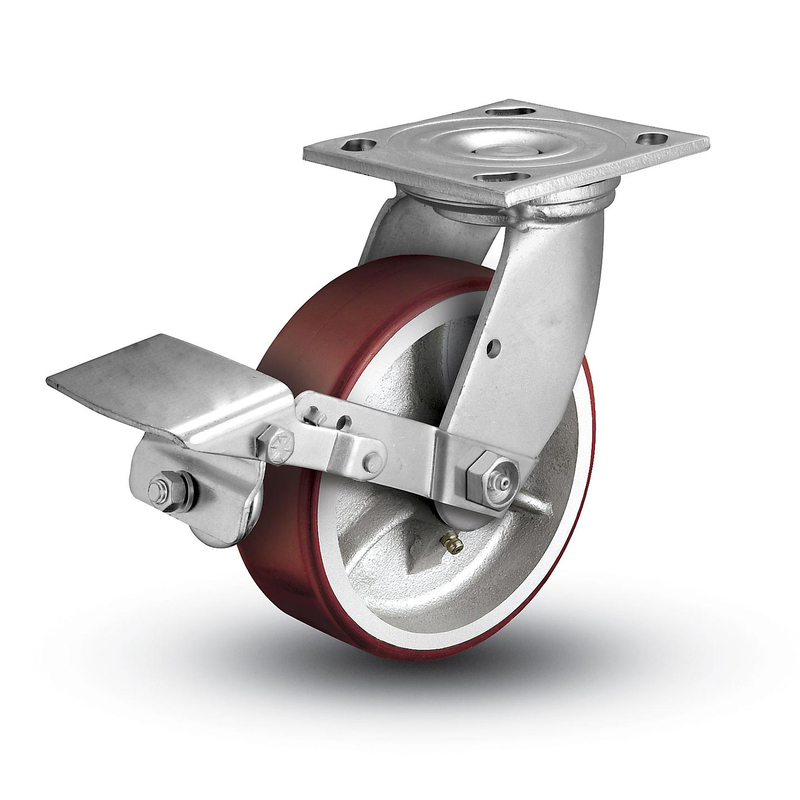 In layman's terms, it turns a swivel caster in a rigid caster: only horizontal movement will be possible when the brake is engaged. Directional lock brakes have recently been made available on Colson’s 2 Series casters, but they must be factory-installed. The double side brake is the exactly the same as the single side lock brake but located on both sides of the caster for easier access. 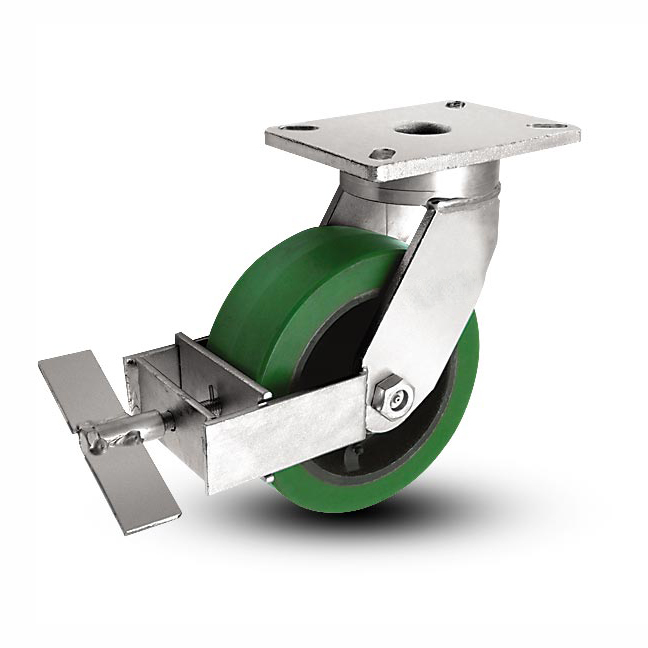 This caster brake must be factory-installed and is engaged by turning one, or both, screws that pass through the caster’s rig, which creates friction against the wheel’s hub. Many of the series offered by Albion have the double side lock as a brake option. Back to top. A face contact brake requires hand-tightening a T-screw or pressing a lever in order to be engaged. The screw or lever moves a brake shoe closer to the caster wheel’s face until making contact, and thus creating friction and affecting the caster’s ease of movement. This brake offers the advantage of controlling exactly how much pressure is put between itself and the wheel. Bestway and Albion both offer face contact brakes for nearly all 2” wide wheels, but they must be factory-installed. Back to top. Poly cam brakes create friction between the wheel’s tread and a metal pad that doesn't allow skidding or slipping when the brake is engaged. Engaging the brake is done by foot and will depress a piece of polyurethane within the brake and cause the non-skid pad to make contact with wheel’s tread. Although these brakes must be factory-installed and require routine maintenance, the poly cam brake offers the advantage of adjusting pressure placed on the tread to any desired level. 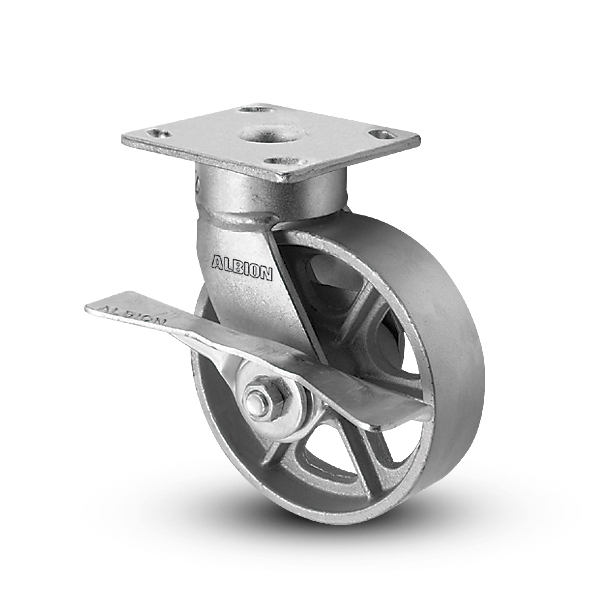 This brake is most frequently seen on Albion and Caster Concepts products in heavy duty applications. Back to top. Though looking nearly identical to a standard side lock brake, the cam wheel brake functions much more efficiently, especially on wheels with hard tread like cast iron or steel. Pressing the brake causes a cam to tighten the axle spacing and produces enough friction needed to stop the wheel from turning. Fewer pieces make this brake light in weight and easy on budgets. The side cam brake is also field installable and compatible with nearly any brand of 2” wide swivel or rigid caster. Back to top. 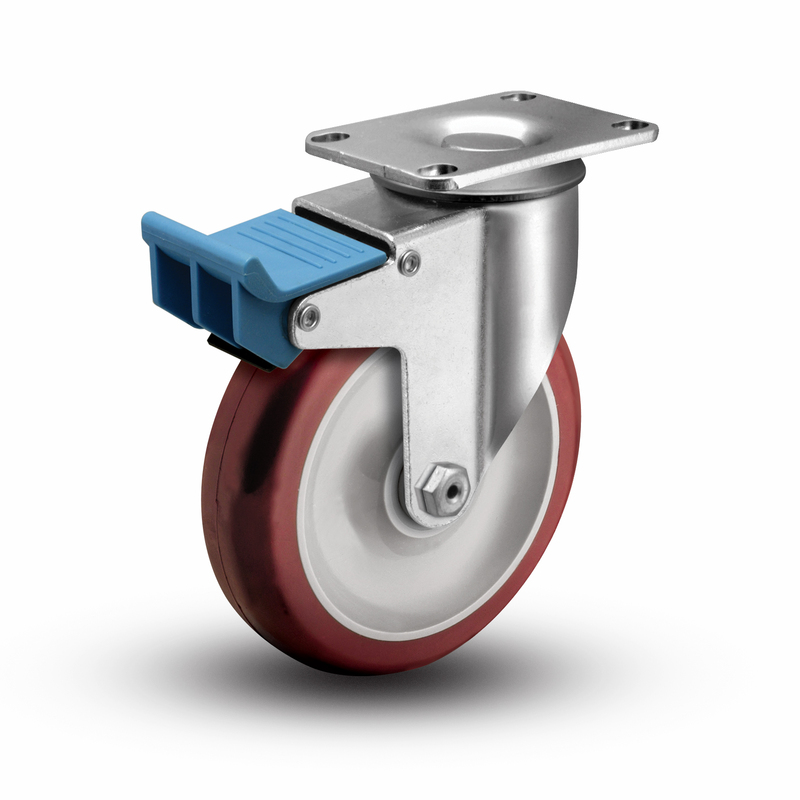 Side lock caster brakes feature a pedal and are normally foot-friendly. When the pedal is engaged, the space between the wheel and its housing is decreased. The friction created by the contact of the two surfaces is what prevents the wheel from continuing to turn with ease. Please note that side lock brakes are not any brake with a pedal on its side. 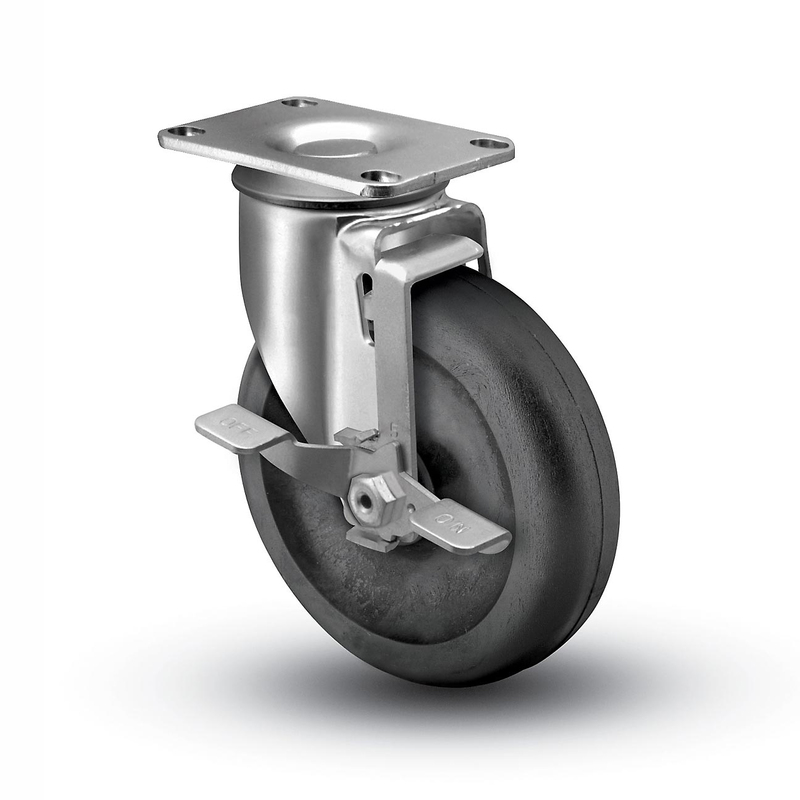 Side lock brakes are one of the most cost-effective and popular caster brakes. Back to top. The single side lock brake requires turning a screw by hand. This screw passes through the caster’s rig and creates friction against the wheel’s hub. Albion’s and Caster Concepts’ version of this brake must be factory-installed and is standard to be assembled for right-handed use, but has a lefty-friendly option available upon request. This brake is typically found in medium and heavy duty applications and is dependable option when seeking a brake. Back to top. 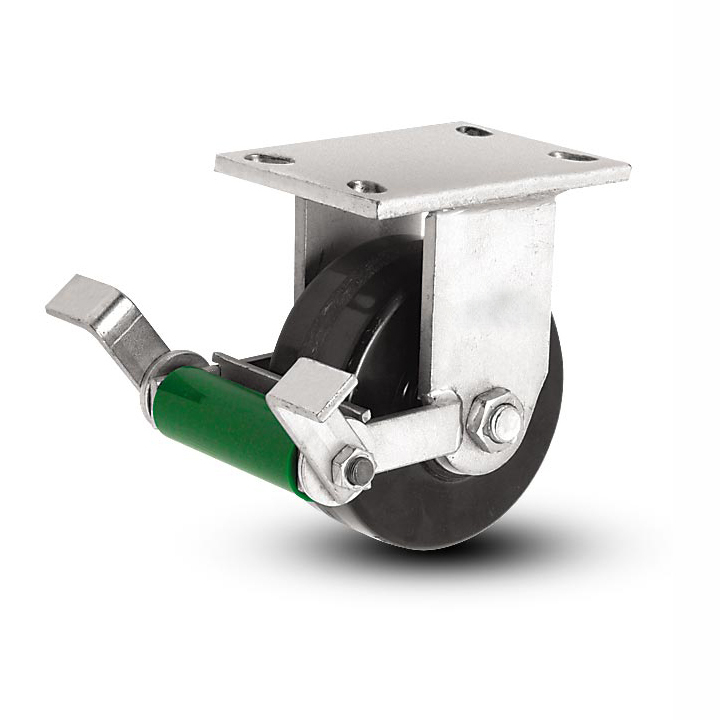 With a super simple one-piece design, the thumb lock brake is an inexpensive yet effective brake option for your casters. To engage this brake, it must be tightened by hand until the thrust washer makes contact with the wheel. The friction created between the two materials prevents the wheel from rolling. The small size of the thumb screw brake makes it most popular in low profile applications and can be found on the likes of Shepherd’s 00 Series. Back to top. Top lock brakes are typically foot-friendly and when engaged will apply pressure to the top of the wheel's tread, creating friction and preventing the wheel from moving freely. Top lock brakes come in many different styles and materials, but the most common is a pedal lever with a rubber pad to create optimal levels of friction. Some of the most popular top lock brakes are seen on Algood and Blickle brand casters. Back to top. The total lock brake is the most recommended of all brake options at CasterDepot. 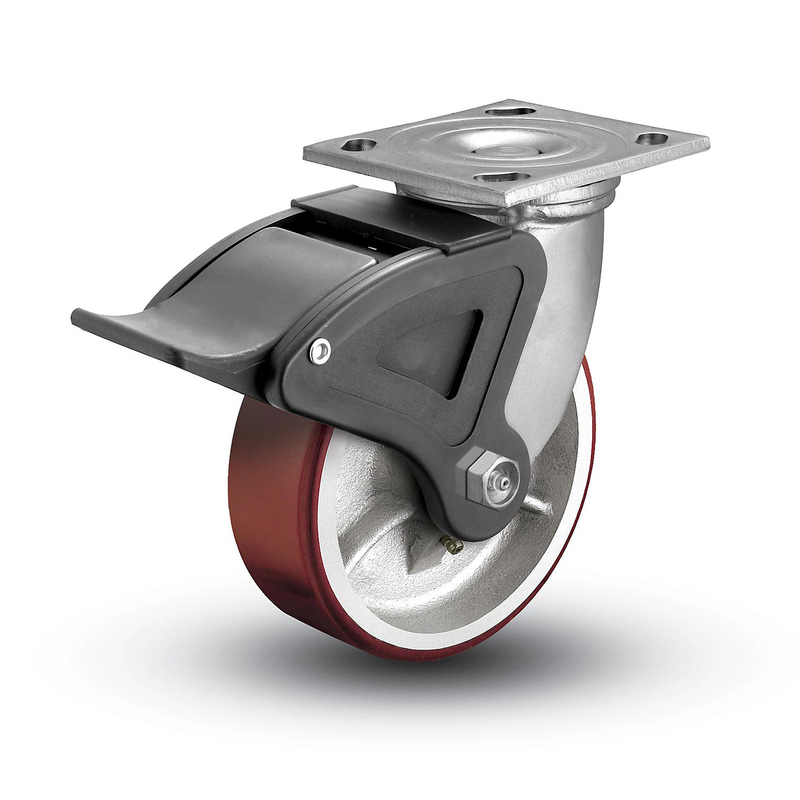 The total lock brake is true to its name: a simple, easy press of the foot locks both the wheel and swivel section, preventing all rolling AND swiveling. For those seeking value, that’s twice the brakes for virtually no price difference. This brake option’s low position makes it easily accessible. Total lock brakes are typically made of rust- and corrosion-resistant thermoplastics with a design that securely fastens the brake to the casters by a grip ridge. These brakes normally consist of just two moving pieces and require no maintenance. Colson’s Tech® Lock brake and Albion’s Grip Lock brake are two of many brands that offer a total lock brake. 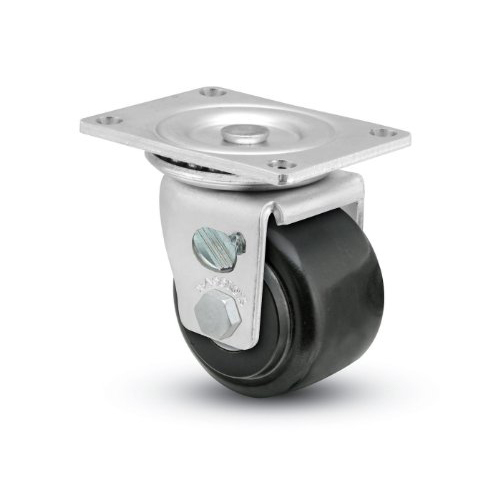 If you are looking to ensure your casters come to a complete stop, look no further than a total lock brake. Back to top. 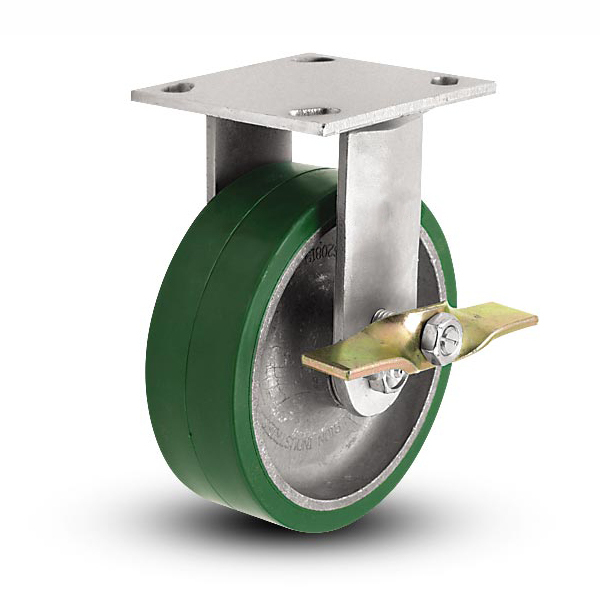 The tread lock brake creates friction between the tread of the caster’s wheel and a metal plate faced with rubber, which hinders the caster’s ability to move when engaged. To engage this brake, all you need a simple press of the foot. 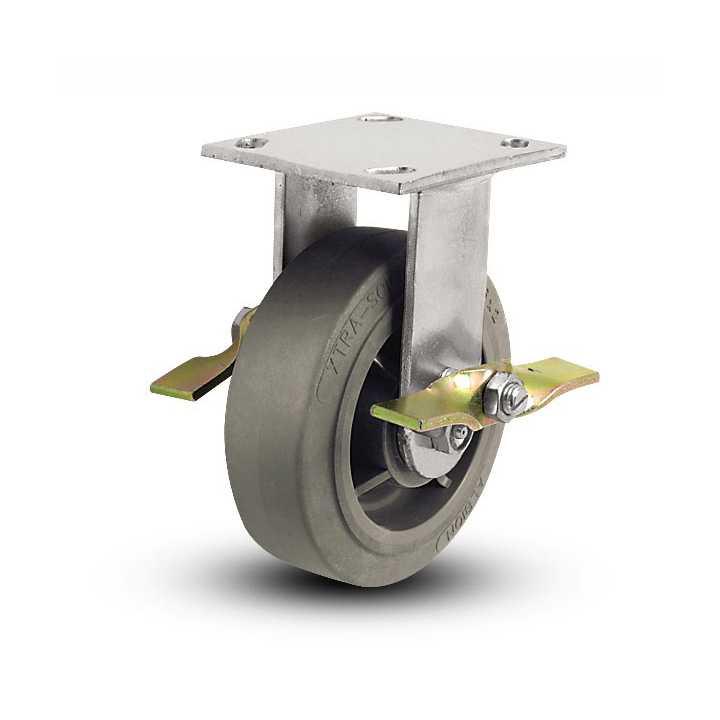 Though we can easily build your casters with a tread lock brake, they are also field installable and available for wheels ranging from 4” to 12” in diameter, including Colson’s 4, 6, 7 and 8 Series products. Back to top.